Gort is one of Christy O’Connor Junior’s creations. If you’ve read any of my earlier blogs, then you know that usually fills me with dread. I find that too much shaping, mounding and exaggerated elements detracts from the natural beauty that every course holds. Fortunately, Gort has been blended into the natural surroundings very effectively, and the great man has produced an intriguing course. There are ups and downs as you move around the hillsides, and there are some brief climbs to be tackled – at the start most notably. 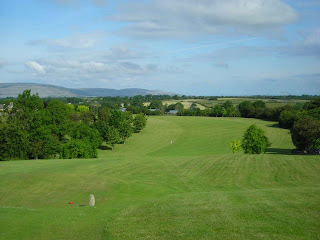 Apparently, many of the older members have started to play at the very new Cregmore Park, due to the flat terrain. And some of the youngsters have been drawn to the same location because Gort is not long enough – or perhaps, they simply need the room that Cregmore Park offers so that they can thrash the ball about. At Gort, there aren’t many opportunities to ‘thrash’ the ball as brains are more important than brawn. Galway Bay is one of Christy O’Connor Junior’s creations. If you’ve read any of my earlier blogs, then… you get the picture I’m sure. 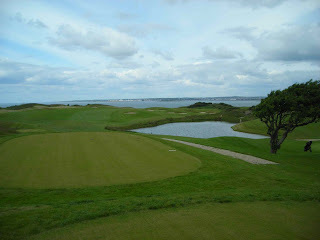 The course is all sways and curves as it heads from in front of the big hotel down to the bay. 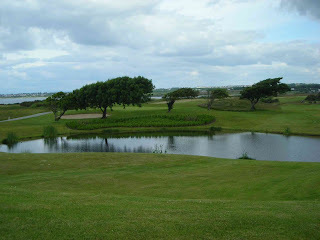 Sweeping views are matched by sweeping fairways and greens, and it looks very tempting indeed. The day was almost still when I was walking around the paths near the temporary clubhouse, and the stark trees were all leaning one way in an ominous signal of how windswept this course can be. The photograph gives you just a taste.